Looking for the perfect roasted chestnut soup recipe? This simple vegetarian and vegan bowl is a fall or winter soup to be savored on a chilly Thanksgiving or Christmas evening or for any fall or winter dinner occasion. 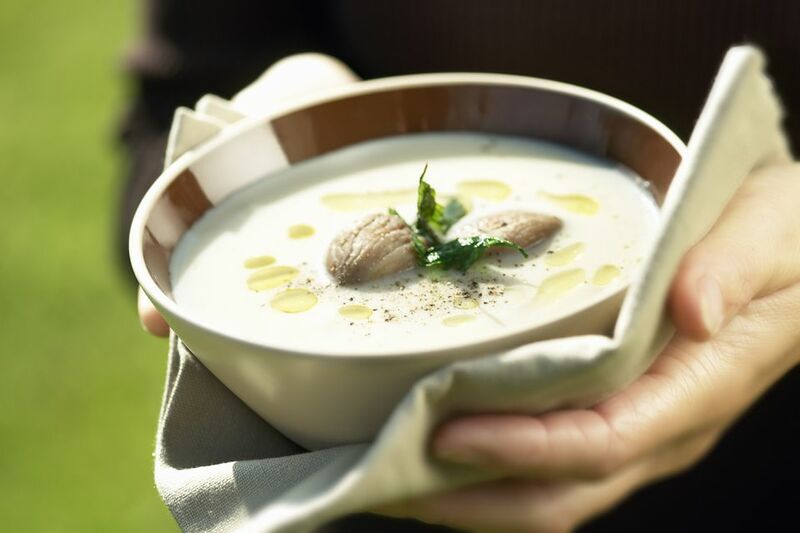 Not everyone likes the subtle nutty flavors of chestnuts, but if you do, then you'll love this easy chestnut soup recipe. This vegetarian chestnut soup recipe is also vegan as long as you use vegan margarine or oil (and not butter) and soymilk in place of dairy milk. In addition, all of the ingredients can be gluten-free, but you'll need to check the ingredients list of your vegetable broth, or buy one which is specifically labeled as gluten-free. Around the holidays, most grocery stores carry roasted and peeled chestnuts that are ready to use in a recipe such as this one (for the best taste, avoid the ones in the can or in a jar in liquid and instead look for any kind in a vacuum-sealed bag). At other times of the year, prepared chestnuts can be a bit trickier to find, so you may want to plan well in advance and buying them online if you have trouble finding them. Buying chestnuts fresh and roasting and peeling them by hand is also an option of course, though it is quite a fair bit of work to do. If you do want to roast fresh chestnuts, they'll need about 30 minutes in the oven at 425 F.
In a large soup or stock pot, saute the minced carrot, celery, and onion in the vegan margarine or oil until very soft, about 8 to 10 minutes.